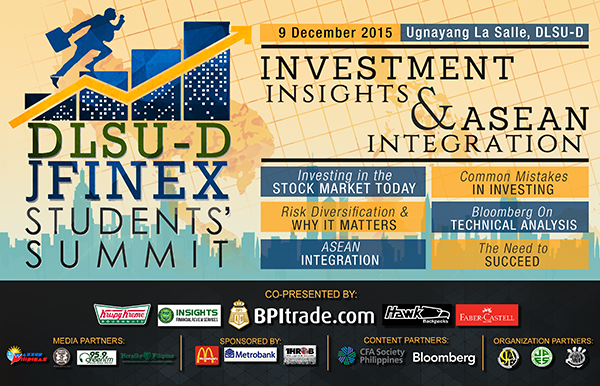 As one of DLSU-D’s most active Recognized Student Organizations, Junior Financial Executives Institute of the Philippines (JFINEX), together with CFA Society of the Philippines and Bloomberg as content partners, will spearheadanevent entitled the “DLSU-D JFINEX STUDENTS’ SUMMIT: INVESTMENT INSIGHTS AND ASEAN INTEGRATION” to promote financial literacy and responsible investing through the insights imparted by esteemed resource speakers. The conference will be held on December 9, 2015, Wednesday, from 8:00 am to 5:00 pm at the Ugnayang La Salle, DLSU-D. In this event, distinguished speakers from finance sectors and Bloomberg Singapore are invited to talk to 2000 business students and professors,as well as young professionals, from different universities and colleges within and around Cavite. This activity aims to enhance the knowledge of the students about smart-investing and its rewards and returns. This event’sline of top-caliber speakers and guests feature some of the country’s most successful finance and investment professionals, as well as regulatory officials and representatives of leading financial institutions. · Mr. Jayson Lo - best-selling author of YOUnique. The summit is intended for students taking up business-related courses such as Business Administration, Commerce, Management, Economics, Industrial Engineering, Accounting, Statistics and Applied Math. Moreover, the said event is open to public and shall welcome other interested individuals and financial-freedom aspirants. To join, the participants should secure their tickets ahead of time (on or before November 30, 2015) to avail a discounted price at PhP350.00 each. Starting December 1 to December 7, 2015, the tickets will be sold at its regular price of PhP400.00. This event is co-presented by BPI Trade.com, Krispy Kreme, Insights Financial Review Services, Hawk Backpacks and Faber Castell and sponsored by McDonald’s, Metrobank and Throb Pro Lights and Sounds. Also included as our media partners are WazzupPilipinas.com,WhenInManila.com, 95.9 Green FM and Heraldo Filipino. This summit is also made possible by Junior Confederation of Finance Associations –Philippines, Junior Philippine Economics Society and Visual & Performing Arts Production Unit – DLSUD as our organization partners.